This comes from the fact that nearly all dogs will use those big, soft eyes, and perhaps some convincing whimpering, to get you to share with them what you are obviously enjoying. It is clear by the unique set of teeth dogs possess, by the way, their digestive systems perform and from their behavior that they are carnivorous by nature, yet they seem to enjoy many of the same fruits and vegetables we eat as omnivores. The debate may rage on as to whether dogs are one or the other, but the fact remains: Dogs, by nature, have a definitively carnivorous bias. Despite this fact, dogs have adapted to the human diet after many centuries of feeding off our meat and non-meat scraps. Is It Safe to Feed Pineapple to Dogs? It is essential to recognize that though dogs appear willing to eat anything we offer them, several of the foods we eat pose a danger to our dogs and, in some cases, can even be fatal. So, it is important to ask the question in earnest as to whether it is safe for your dog to eat what you are eating. In the case of pineapple, the answer is yes, it safe for your dog to eat pineapple, in moderation. When you think about it, everything your dog eats should be given in moderation. The typical diet is given in the morning and the evening comprising no more than a few ounces each. While their stomach capacity is larger, designed to initially accept a bigger portion with a higher concentration of stomach acid to digest animal protein, the amylase enzyme needed to process plant-based foods is not introduced until further down the digestive tract in the pancreas and small intestine. The dog food products on the market seem very specialized, especially the kibble or dried foods. 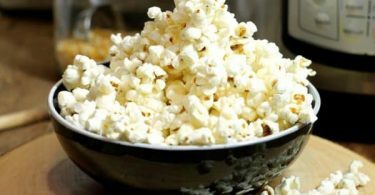 Some of them are aimed at mostly meat ingredients while others favor vegetables and still, others are nearly entirely comprised of cereal grains and beans. How do you choose? Understanding how a dog’s system is optimized for consuming meat makes it easier to know what food is better for them. Dogs tend to be happy with the same diet every day. It is when we alter their diets without making a gradual shift that they can experience stomach upset, vomiting and possibly diarrhea as well. As much as your dog may try to convince you that what you are eating really needs to be in their stomach, remember to proceed with caution for their sensitive systems. Is Pineapple Bad for Dogs? Anytime you offer your dog something off the menu, it is best to try a few pieces, and then, see how well your dog settles with it. Assuming you have cleared the item on the list of foods you must never feed to your dog, your first indication of whether your dog can handle the treat is to see how they react to it. If following the ingestion of pineapple, your dog is either vomiting or has diarrhea, then you can trust it is not a good idea to pursue it. Fresh pineapple has a lot of fiber and natural sugar, both of which present a potential hazard for your dog. Too much fiber in a dog’s digestive tract can cause constipation and dehydration, and too much sugar does exactly what it does to us humans leading to obesity and diabetes. Excess pineapple can certainly give your dog an upset stomach. How Many Pineapples Can Your Dog Eat? When feeding pineapple to your dog for the first time, try a couple of small, bite-sized pieces to start, and then, observe them for any kind of reaction. Dogs are not meant to eat very much sugar, despite sharing a lick of your ice cream cone or that piece of your cookie. Starting off slow and monitoring your dog for any adverse reactions will determine if you can safely offer more or halt feeding them pineapple altogether. Dog trainers may use small pieces of fresh pineapple as an incentive for complying with commands. You may like to provide some pieces to your dog as an occasional treat, but it should not be given daily or as a regular part of the diet. Offering one to two small pieces or slices is a good rule of thumb when it comes to feeding your dog anything that is naturally sugar-rich, like the same portion recommendations when it comes to giving your dogs oranges. Your dog is going to try to get you to give them more, but it is up to you to be a good steward. Their gentle care is in your hands, and the last thing you want to do is cause the slightest suffering for your best friend. What are the Health Benefits of Feeding Pineapple to Your Dog? Once again, in moderation, feeding pineapple to your dog offers a wealth of nutritional benefits. In some respects, pineapple is a kind of superfood for your dog even given in small portions over irregular periods. Your dog can experience the same energy kick and nutrient boost to the immune system that we get from eating pineapple. In younger dogs, the Vitamin C in pineapples is not as beneficial as it is to older dogs since they do not produce as much as efficiently. The manganese is helpful in strengthening bones and joints. While the fiber content in fresh pineapple assists digestion and can help relieve constipation when given in moderation, overeating pineapple can do the opposite and cause both constipation and dehydration as it tends to absorb all the water in the stool. In moderate amounts, pineapple can act as an anti-inflammatory food aiding in the reduction of swelling. This can be helpful with over-active or energetic breeds that tend to sustain injuries due to running and playing with other dogs. These may be mild injuries, often unnoticeable, that present some swelling, nonetheless. Should you want to use pineapple specifically as an anti-inflammatory, you should proceed in tandem with the advice from your veterinarian. Other dog-friendly fruits and vegetables that aid with inflammation is broccoli, cantaloupes, and cherries. Bromeliads are tropical plants typified by the way they can hold water. You can easily recognize them for the way their leaves form channels that collect and deliver water to the plant’s complex architecture. This system is considered a biodiversity amplifier. Bromeliads have provided a fascinating form of laboratory for researchers studying their life-giving attributes. Pineapple plants are the only bromeliad that uniquely produces the sweet and delicious fruit, which has not escaped scrutiny by scientists. At the center of their interest is the enzyme called Bromelain. This proteolytic Bromelain enzyme is effective in breaking down proteins, which makes it unacceptable for use in jams or gelatin as it prevents setting. This enzyme makes for an excellent meat tenderizer, which is found in many different marinades. It is also this quality of breaking down proteins that makes pineapple so beneficial to dogs. As carnivores, dogs need to eat a high-protein diet. Since the Bromelain enzyme helps to break down proteins, feeding pineapple to your dog helps them to better absorb other nutrients. This is useful because most dog foods are designed to be protein heavy. In the best-selling book Life Extension, authors Durk Pearson and Sandy Shaw have written about the powerful anti-inflammatory properties discovered in Bromelain. As Bromelain has gained recognition as a naturally effective pain reliever, scientists have found it can provide comparable relief without the problems typically associated with pharmaceutical drug therapies. Athletes share in the benefit of ingesting bromelain to help manage sports-related injuries the same way your dog can get relief from swelling due to injury. Ongoing research indicates Bromelain is effective in managing other conditions such as sinusitis and inflammatory bowel disease. Further study has revealed Bromelain exhibits critical tumor-fighting properties, which continue to be explored in the hope of discovering a new cancer-fighting drug. It is not uncommon for dogs to suffer from arthritis as they get on in years. Since studies have shown how effective Bromelain has proven to be in dealing with the pain of osteoarthritis, your dog may end up being far ahead of the ensuing clinical trials intended to demonstrate increased levels of improvement with the ultimate benefit of decreasing drug dependency in human treatments. What Parts of a Pineapple Can Dogs Eat? The only part of the pineapple you want your dog to eat is the sweet, fleshy fruit inside. 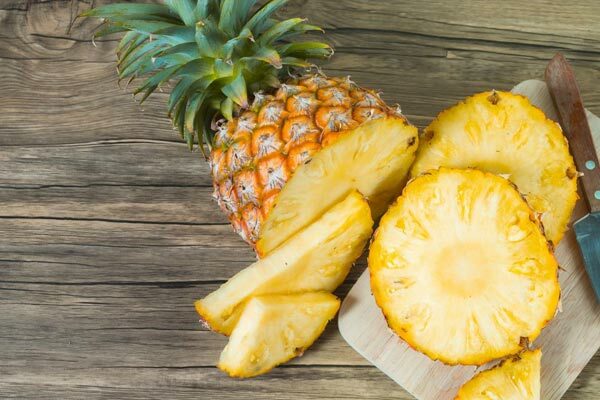 According to Dr. Danielle Bernal, a veterinarian with Wellness Natural Pet Food, pineapple is safe for your dog to eat if you remove the thick, spiky skin, the tough core in the center of the fruit and do not feed them the leaves, either. If you remove the top with care, you can start growing your own pineapple plant. To make the most of the rewards of Bromelain, you only want to feed ripe, freshly sliced pineapple to your dog. You can check if a pineapple is ripe by smelling the bottom of the fruit. If it smells sweet, it is fresh, but if you cannot smell anything, then it is not yet ripe. Can Dogs Eat Canned Pineapple? The whole point of feeding pineapple to your dog is to make the most of the Bromelain enzyme. The only source of Bromelain comes from the fresh pineapple. Canned pineapple not only does not contain any Bromelain, but it comes packed in sugar water. Hoping to save time or avoid the work of cutting down the pineapple by serving canned pineapple provides little to no benefit at all. Is it Safe to Give Your Dog Pineapple Juice? The juice from the fruit of the pineapple is just as good as the fruit itself, provided it is given in moderation. The beverage is abundant in the natural acid, which can cause your dog stomach upset as well as diarrhea. You should also avoid the processed and sweetened juices, which can make your dog sick. What About Feeding Pineapple to Dogs to Stop them from Eating Poop? Coprophagia is the clinical name for the condition of dogs eating poop. While there are different reasons for this behavior, it can help to know why your dog is doing it before you can find a suitable solution. It could be from boredom, especially if the dog has come from the barren environment of a puppy mill. It may be a learned behavior from other dogs or it could be the result of being punished for going inside the house. While the punishment does nothing to stop the behavior, it could reinforce it instead as the dog seeks to remove the evidence by eating it. Still, it could be the result of a dog not being stimulated enough both mentally and physically. All these reasons notwithstanding, it could simply be that the dog enjoys the taste and smell and ends up anchoring the behavior as a bad habit. Referring to kibble diet options available at the store, some low-grade dog foods just may taste the same both coming and be going. Higher grade dog foods allow for better absorption as it is digested. Feeding your dog pineapple seems to produce an extremely undesirable smell and taste to the poop that deters the habit. You do not want to feed your dog anymore pineapple that has been recommended for this purpose, though. With most dogs, they tend to go back to eating the poop when they are not eating the pineapple. Therefore, it is best to supervise the dog when out for a bathroom break, so you can immediately remove their leavings. With clean up, keeping a vigilance of awareness and re-directing the behavior, you can use the pineapple to help break the habit. You may also want to stay up to date with regular worming and vaccinations to protect your dog’s good health. 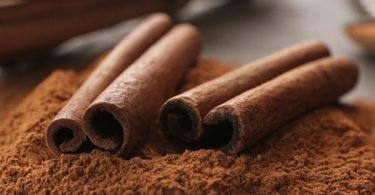 Cinnamon is Safe for Humans AND Dogs? Is a Turkey Dinner as Safe for My Dog as it is for Me? What Are The Best Vegetables for Dogs to Eat?